We are back again with another set of free writing printables! This time, we are featuring a St. Patrick’s Day theme with a fun ombre color scheme! I really enjoy St. Patrick’s day as a holiday as I have a lot of Irish blood in me, and it’s just kind of a quirky, lighthearted, fun holiday that you can do a lot or a little for unlike the major holidays. This worksheet is a really fun way to introduce the holiday, or just work on handwriting practice during the holiday season, with your kiddos. Great for homeschooling, preschools, or just a fun activity to do at home! I know my boys can always use more handwriting practice, it’s the area they rush and get sloppy in, so making it fun with a theme around the holidays makes it a worksheet they don’t mind doing! Plus, they are working on their vocabulary and spelling at the same time! Bonus points!! 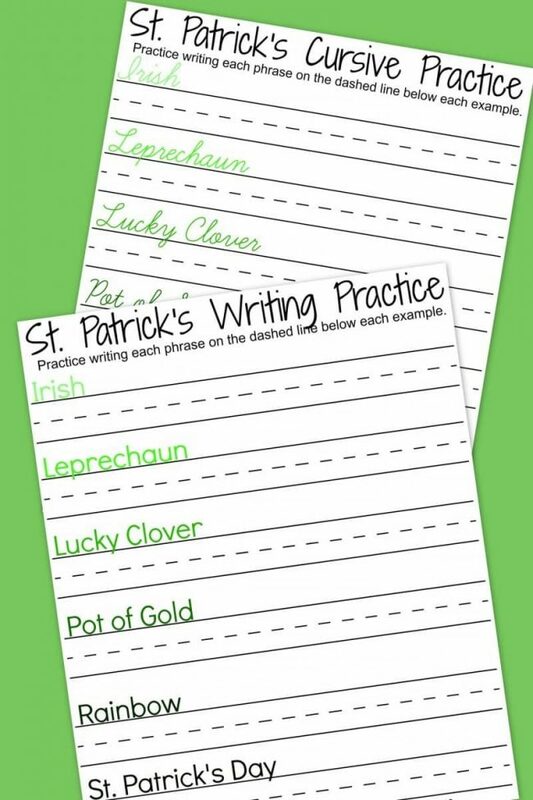 Click the image or the link above to grab a copy of our St. Patrick’s Day Free Writing Printable. The link will open up a PDF doc in a new tab which you can save or print and use for your own personal use. This printable is not for resell or any other use. If you want to share it, direct your friend back to this post to grab their own copy. Thanks! Check back for an Easter themed worksheet coming up next!! How do you incorporate learning and fun around the holidays? This is a perfect themed writing sheet! Kids would love practicing these words! SO cute! Thanks for linking up at #MerryMonday link party! Such a great idea! Thanks for sharing these with us. I love these printables!! I know my kids loved when we could tie in the holidays with their learing like this. What a fun idea. I know at a our neighbors a leprechaun visits with gifts and glitter on St. Patrick’s Day, so this would be great for that. What a fun idea- we used to do cross words and word searches to help build learning skills around the holidays. I think this is a great addition! Thanks for sharing such a nice printable. It’s always more fun to practice handwriting away from your main workbook. That is really awesome. My daughter is perfecting her cursive and will just love these! Thanks! Love this! Thank you 🙂 Pinning for our March 17th festivities! !